Biola University’s School of Cinema and Media Arts is set to launch a new Game Design and Interactive Media concentration in Fall 2019. Professors are excited about the new offering due to student interest and growing career opportunities in the game industry as use of virtual and augmented reality rises. In addition to games as entertainment, game design is practically applied in simulation, education, marketing and audience engagement, decision theory, therapy, and new applications that surface nearly every day. Professor of cinema and media arts Michael Steffen was hired last fall to spearhead Biola’s game design courses and, now, the new concentration. The School of Cinema and Media Arts currently offers three concentrations: Media Management, Production, and Writing for Film and Television. The addition of the Game Design and Interactive Media concentration provides students an opportunity to learn and deliver an experience that is unique to game design. With interactivity being a key component of game design, students are trained to become cinematic storytellers who can effectively integrate story with gameplay. Students will be challenged to explore beyond traditional storylines and grow in game narrative techniques. Students also gain hands-on experience with 3D art-making, game engines, and emerging technologies, such as virtual and augmented reality. The exposure to interactive mechanics allows students to engage with iterative design and develop fundamental game design skills. Through the concentration, students are equipped to create story-driven games by leveraging state-of-the-art technology and innovative storytelling. Students will be given the opportunity to showcase their work at independent games festivals, such as IndiaCade and IGF, and further their expertise in game design as an intern at a game or media company. 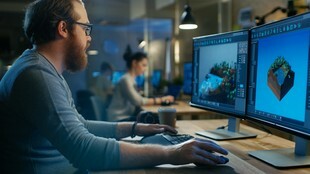 Both internal school support and external real-life experiences prepare graduates to become designers and producers or as independent developers in the game industry. Besides skill-based professional development, students will explore how to navigate the game design industry as a Christian and integrate themes of faith into the work they produce. Learn more about the Game Design and Interactive Media concentration and apply online now for Fall 2019. Written by Irene Pan, media relations intern. For more information, contact Jenna Loumagne, manager of media relations, at (562) 777-4061 or jenna.loumagne@biola.edu.